Email signatures spare you from having to type a signature manually every time you compose an email. 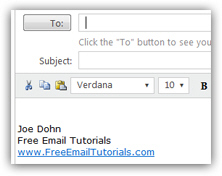 This tutorial explains how to create and automatically add an email signature to your emails in Hotmail. This tutorial explains how to create a signature, how to customize it, and how to delete it (using in other words a "blank email signature"). To setup and automatic email signature in Windows Live Hotmail, click on the Options menu at the top right corner of the screen: then choose the last item, labeled "More options" to load all Hotmail configurable settings. The Hotmail options screen will open: locate the Personal e-mail signature link listed under Customize your mail. This will open the Personal e-mail signature screen that lets you create and customize your email signature. The box listed under the "Enter text below to be added to the bottom of each e-mail message you send" message is the text editor that let you format your Hotmail signature in any way you want. Simply type your email signature as you would like it to appear to recipients of your emails. Notice that the signature editor is the same text editor we covered in our email formatting tutorial. Add as many formatting options as you like (e.g. bold, underlined, text color, etc.) Also notice that you can include clickable links inside your signature - you can manually create the link, but Hotmail will automatically convert what it recognizes as an internet address ("URL") into a link. The editor you use to create your signature supports rich text formatting, but Hotmail will ultimately decide on the formatting options to display in your signature based on the email format itself: to send an plain-text email (and use a plain text signature), simply click on the Rich text menu, and choose Plain text. This will instruct Hotmail to ignore any formatting information, colors, etc. from your signature, and to instead just display its "text" content. 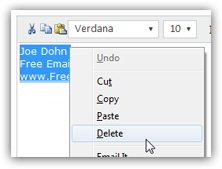 To save the Hotmail email signature you just created, click on the Save button. This will bring you back to the Hotmail options screen we came from. To test your email signature, click on the Go to inbox link to get back to your emails, and click New to compose a new email. Your email signature has automatically been added to the body of your email. 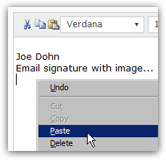 This signature is regular text, which means that if you want not to show this signature on some emails, you can select its text, and hit the Del or Backspace keys to delete the signature text. 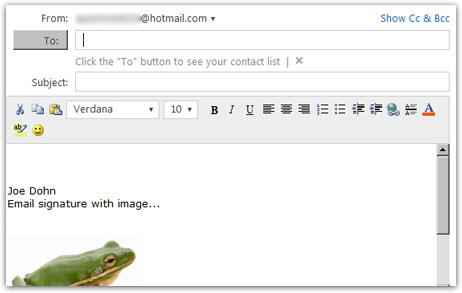 Since Hotmail supports "HTML" rich-text emails, it also lets you add a picture inside your email signature: this may not be so obvious, since there is no button allowing you to insert an image: but as you'll see, you don't need an Insert Picture button. 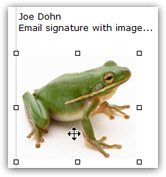 To add an image to your Hotmail email signature, simply locate a clipart or picture file you like, and copy it: if you found an image online, simply right-click on it and choose "Copy" - this will place the graphic inside the Windows clipboard (the same principle applies in Apple's Mac OS X). Once you have copied the image, return to Hotmail's signature editor, right-click where you want to add the picture, and choose Paste. If the holding-down-the-Shift-key technique doesn't work for you, simply adjust the corners of the image until it looks "right". Either way, trust your eyes to make sure that the picture looks proportionate, both horizontally or vertically. While Hotmail does properly resize the image inside your signature, note that some email programs will display the image in its original size: the ideal solution is to resize your picture with an actual image editor. (If needed, here is a free image editor for Windows you can use to resize the pictures you want to use in your email signature.) Back up ↑. Once the image you want to use in your email signature is the correct size, release the mouse button, and Hotmail will adjust the image dimensions to fit inside the signature. Make sure that the image is properly aligned with the rest of your email signature (with a blank line separating the signature text and the top of the picture, for example). Once you are satisfied, hit Save, and Hotmail will automatically add your updated signature next time you send an email. If, like most people, you use your Hotmail account for both business and pleasure, keep in mind that the image you choose for your Hotmail email signature says a lot about you. Applying for a job from your Hotmail account, including an odd, or downright distasteful picture choice in your email signature, is something you could end up regretting. Make sure that your Hotmail email signature does not contain any image or slogan that could offend. Although inserting a joke or funny quote in your email signature may seem harmless, that may be interpreted differently in some circumstances. If you end up changing your mind, and no longer want Hotmail to automatically append a signature to your outgoing emails, simply follow the procedure we outlined above: load the Hotmail options and access the email signature settings: once you are in front of the signature editor, simply delete all the text inside the text box, and click Save - this, in effect, saves a "blank email signature", which is Hotmail's default. Behind the scenes, Windows Live Hotmail always insert a signature inside your emails, but since the signature is blank, or an "empty signature" by default, it behaves as though no signature is inserted in your emails. And that's how you automatically add a signature to email messages sent from Hotmail!